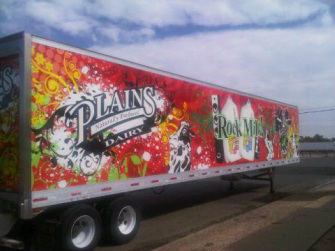 Plains Dairy and its hometown, Amarillo, have a lot in common. Both were established to meet the demand for a central entity that could regularly deliver products and services needed by an emerging population of pioneers settling over the Southwest. The Texas Panhandle was raw rangeland when Col. Charles Goodnight drove the first cattle to the famous JA Ranch along Palo Duro Canyon. That was near the time railroad companies built crossings in the central Panhandle and settlers staked claims. In 1887, Amarillo officially became a town. As families moved to the new frontier community, visionary rancher and businessman Henry S. Sanborn built the Amarillo Hotel. Appropriately, it was painted yellow by the man known as the Father of Amarillo. The city was named the Potter County seat in 1893. Between 1892 and 1897, the Fort Worth and Denver railroad shipped some 100,000 cattle from the growing city. History says that more cattle were shipped from Amarillo that any other rural point in the United States. Those were cattle raised to meet the beef demands of a growing nation. A few cows were undoubtedly singled out for milking. Most rural homes, and many in town, had their own milk cows. Many households likely wore out a butter churn or two long before modern dairies were established across the sprawling nation. As Amarillo grew, so did the need for more milk and other foods. By the 1920s, more families called Amarillo home. J. Lindsay Nunn, who had moved to Texas in 1905, saw a dairy investment opportunity. Nunn’s father, J.E., had helped start the Amarillo Daily News in 1907. He was a media mogul operating numerous newspapers and other publications. But the younger Nunn sought more business ventures on his own. Eager to diversify his income potential, in 1929 Nunn lent a man money to buy 70 cows and a section of land to start a local dairy that is now the Tradewinds section of Amarillo. Nunn had graduated from Georgetown College and had some business sense. His milk-minded borrower apparently did not. Within two years, Nunn saw that his investment for milk production was going sour. His borrower was virtually broke. After realizing he wasn’t meant to be a dairyman, the man walked into Nunn’s office and declared, “I’m busted – you can have the whole thing.” With his investment in jeopardy, Nunn had no choice. He took over the dairy himself. The dairy operation had monthly revenue of about $1,700. Nunn saw an opportunity for profit. In 1934, the soon-to-be-familiar name “Plains Creamery” was adopted and the dairy moved into Amarillo. It became incorporated and added a second truck for deliveries. The business quickly grew at its location at Second and Taylor. Its prominence in the city also grew. 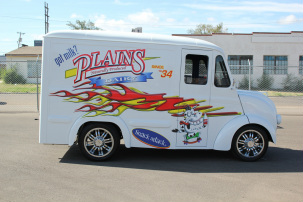 Familiar Plains Creamery delivery trucks were a welcome sight to local homes and businesses. In 1937, Amarillo newspapers carried one of many holiday advertisements from what had become the city’s Home Town Dairy. The catchy slogan, “Drink Plains Milk for Health, Beauty and Charm,” helped assure customers they were receiving the finest dairy products available. Nunn admired Amarillo’s business leaders and the dedication they showed in building the community. He was an original contributor to Cal Farley’s Boys Ranch, a regional home and school for youth. Nationally, he expanded in media ventures like his father. He owned more than 25 newspapers and five radio stations. He was also involved in telecommunications and electric utilities. By the early ‘40s Nunn had also moved his diversified business operations to Lexington, Ky. In another livestock-oriented venture, he started the Kentucky Hereford Association and also published the Kentucky Hereford Journal. Nunn needed more assistance in keeping the dairy running in an efficient manner. In 1943, A.F. Madison came to Amarillo from Roswell, N.M. to manage the operation. Madison was a friend of the family. In fact, as a boy he even threw newspapers for the Nunns. In those World War II years, the dairy had about $100,000 in capital and had gross annual sales of about $400,000, according to reports in the Amarillo Globe-News. Madison quickly became heavily involved in the local business community. He served as president of the Amarillo Downtown Kiwanis Club and was eventually elected president of the Amarillo Chamber of Commerce. Strong growth continued through the ‘40s and into 1950. In 1951, Plains moved to Third and Taylor. By the early ‘50s, gross sales reached some $3.5 million. In the fall of 1954, Plains Creamery became affiliated with National Dairy Products Corp. It was accomplished via exchanges of stock. It continued to operate as Plains, a Texas corporation, and carry National’s “Sealtest” brand. Sealtest was well known, with its products distributed to “virtually every country in the western hemisphere,” according to a Globe-News report. In 1955, Plains became eligible for the Sealtest trademark after meeting strict laboratory regulations for cleanliness. New additions were made, including a cottage cheese processing vat and more modern pasteurizing equipment. 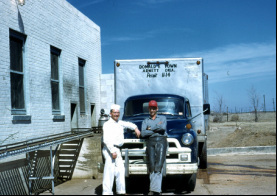 Besides the Amarillo main dairy, branch plants were now operating in Arnett, and Pampa and Borger, Texas. “I hired A.F. Madison to run the thing and added modern equipment as we went along,” Nunn said. “All in all, the dairy turned out pretty well.” The Globe-News reported “the creamery has expanded its market to cover the North Plains of Texas and Western Oklahoma, both in sales and as a milk supply area.” It was now running about 115 trucks to distribute its products and to bring milk to Amarillo from such distant points as its Arnett, Okla. plant. 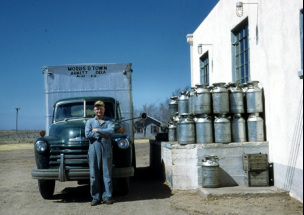 More advanced refrigeration systems enabled the dairy to gather Grade A milk and ship it to Amarillo in cooled tank trucks. In the mid-‘50s, television was still in its infancy. Children’s programs became popular nationwide, and Amarillo was no exception. KGNC-TV (now KAMR) started a show called “For Kids Only.” One of the stars was Jerry Frisbie, who had been hired by the station as an artist. “Those were the BC days, ‘before color,’” said Frisbie, a retired commercial artist. “Everything was black and white and everything was live.” He joined others on the show and did drawings for youngsters. He was later offered a job to become an artist for KFDA-TV. He took it. Warren Anderson, a ‘50s local personality with Channel 10, had an afternoon show that centered on a sheriff-like character. It was called “The Plainsman,” and was sponsored by Plains in 1957. “Two other guys worked on the show, but decided to move on,” Frisbie said. “Warren had taken a liking to me and asked if I would take over. I wasn’t interested, but he kept after me. I finally decided to take on the role. Someone from the dairy would deliver a few bottles of chocolate milk every day. Once in an obvious mix-up, sour milk was brought to the TV station. After one taste, Anderson, again on live television, described the toast as “very interesting.” Frisbie was a little more blunt. “I don’t think I’ll be toasting today,” he said. He also made a few grimacing faces that were caught on camera. The curse of live television forced cancellation of the show. However, The Plainsman had brought Plains into more homes and introduced kids to Plains products. Good employee relations and communication have always been important to Plains. In the late ‘50s, the Sealtest Reporter company newsletter was popular among employees. Sympathy went out to those who had lost loved ones, and savings plans through the company credit union were promoted. The newsletter teased members of the company’s bowling league teams. In the family spirit, it even mentioned who was on vacation and where they traveled. Meanwhile, Madison’s strong involvement in the community was rewarded when he was elected Amarillo mayor in 1960. In 1961, he was recipient of the prestigious Amarillo “Man of the Year” by the Globe-News. He led the Amarillo City Commission in strong negotiations with Lubbock officials on key Canadian River Dam issues that helped initiate major water distribution for both cities. A new era in Plains history began in 1965 when the Sealtest Dairy was sold to L.B. Parker. It should be noted that Sealtest’s prominence nationally remained apparent through the late ‘60s, when it sponsored an ice cream store at Walt Disney World’s Magic Kingdom. There was the Sealtest Ice Cream Parlor and Sealtest Ice Cream Wagon alongside Mickey, Minnie and Donald. At the same time the familiar name, “Plains Creamery,” was brought back by Parker. It was immediately welcomed by the city and Panhandle region. Parker came to Amarillo from Little Rock, Ark., where he was general manager of Borden’s in Little Rock, Dallas and Denver, Colo. He knew milk. He had entered the dairy business after serving in the Army in World War II. He was an avid athlete and excelled in swimming. Later, he even competed in senior Olympic events and won several medals at the Texas Senior Olympics. A short time after buying the dairy, Parker negotiated a merger with W.M. Anderson to merge Plains with Anderson Dairy Co. Parker became president and Anderson was vice president. The name continued as Plain’s Creamery. Plans for a $150,000 expansion were announced for the E. Third and Taylor operations. Growth continued, and in early 1971, one of Amarillo’s oldest businesses, Lane’s Ice Cream Co., was acquired by Plains from Gandy’s Inc., a San Angelo dairy. As Plains celebrated its 37th year in July ‘71, 90 employees were now on the payroll. Parker noted in a Globe-News story that the company annually purchased about $2.7 million worth of raw milk and other goods and services locally. Plains continued growing. It expanded in 1973 when a $220,000 modernization program was announced. It included a five-year plan to invest in new automated receiving and processing equipment. Parker indicated in a newspaper story that Plains had faith in “the growth potential of the Amarillo area” and that the program would enable the plant to double its production. The ‘70s also saw Pokey the Clown become a familiar figure in the Plains Creamery promotional efforts. Pokey (Doug Smith) entertained thousands of youngsters at rodeos, parades and other events. His smiles connected to many, and Plains has long been proud of his association with the company. Parker and sales manager/right-hand-man Frank Jones continued their roles in community involvement. Bill McCarty was a close friend of Parker. Both were active in the Downtown Kiwanis Club. The civic organization was, and still is, known for its work to enhance youth programs across the city and Panhandle. McCarty was part of McCarty-Hull, a regional wholesaler of snacks, tobacco and other products. 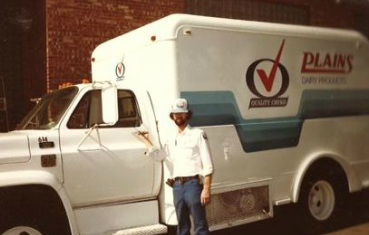 Although he didn’t work directly with Plains (McCarty-Hull now buys products from Plains), he recognized the strong community spirit of the dairy and Parker. As the ‘80s arrived, Plains remained dedicated to improving its products and maintaining its loyalty to its thousands of customers. It joined “Quality Chek’d,” a national quality-testing and marketing association. The familiar red and blue Quality Chek’d trademark reached across 42 states and into Canada. At the time, Plains was serving about 600 grocery stores, restaurants and institutions. Most of the raw milk came from New Mexico, which was seeing a large growth in its dairy industry. Plains was spending about $7 million annually on raw milk from regional dairies. Its payroll surpassed $1.3 million. One of Plains Dairy’s long-time customers is the regional convenience store institution, Toot’n Totum. Now with some 700 employees and more than 60 stores, Toot’n Totum began in 1950. That’s when a young entrepreneurial couple, Eldon “Lefty” and Novie Mitchell established their first convenience store at 15th and Washington in Amarillo. Early on, customers would literally drive up, toot their horns, and a store clerk would tote the orders outside to the cars. Drive-through locations are now featured at many of the chain’s outlets and other convenience stores. When Mitchell returned to Amarillo after graduating from the University of Oklahoma, he joined the Toot’n Totum team in 1974. As a boy he had done his share of chores in the convenience stores. He developed a good work ethic from Novie, Harley and Parker. “When I joined the company after college, L.B. took me under his wing,” Mitchell said. “He taught me that if one company gets another company’s last nickel, there wouldn’t be many other deals down the line. You have to do what’s fair for both sides. Plains is now, and has always been, a major contributor for its local community. Those contributions have been recognized many times. In 1987, the Amarillo Advertising Club presented its Community Service Award to Parker and Plains Creamery. The Community Service Award recognizes local businesses that have made considerable contributions in the field of advertising and community service. Dealing with hometown businesses, such as Plains, has always been important for Toot’n Totum and other regional companies. “We’ve all enjoyed seeing those Plains milk trucks driving across town, ever since we had our own milk man,” Mitchell noted. The dairy’s ability to remain part of the Amarillo region continued through the ‘80s and into the ‘90s and beyond. Even when the L.B. Parker-Plains Creamery era ended, the Hometown Dairy remained. 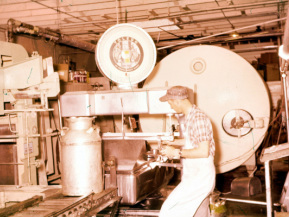 Parker’s ability to maintain a solid local dairy operation was admired by Affiliated Foods, Inc. It wanted that type of dairy as part of its growing company. In 1996, Plains was acquired by Affiliated, one of the nation’s most respected grocery wholesalers. Affiliated had gained a solid reputation. After World War II, consumer goods were in short supply. The demand far out-stretched what was available to the general public. Chain store unit numbers were soaring, causing many manufacturers and producers to refuse to sell to small businesses. The backbone of nationwide food distribution, hometown grocers, were in jeopardy of extinction. But in 1945, a group of these independent retailers from Oklahoma, New Mexico and the Texas Panhandle banded together to form Panhandle Associated Grocers, Inc. It later became Affiliated Foods, Inc. It was established to meet the needs of grocery stores and restaurants in Texas, Oklahoma, New Mexico, and eventually Colorado, Arizona and Arkansas. The Amarillo-based company delivered the freshest and highest quality produce, meats, bread and baked items and dairy products available – and still does. Amarillo’s only dairy processing plant is expanding to meet a growing demand for milk. A new $1.2 million production facility at Plains Dairy Products will be in operation by the end of July (1999), pushing the company’s production capability to more than 120,000 gallons a day. “We are phasing out paper containers and our pint and quart sizes will all be plastic once the new equipment goes on-line,” said Dub Garlington, president of the company. Plains’ gallon and half-gallon containers are already plastic. Soon, each minute of the workday, Plains will be able to bottle 200 half-pint, pint or quart-size plastic containers – for a total of 90,000 units during an eight-hour shift. Garlington said demand is increasing both for smaller, individual serving sizes and for plastic containers. Earlier this year, Plains introduced a new product line called “Snack Attack” that features milk and other drinks in 16-ounce plastic bottles. Part of the Plains Dairy expansion also included two corrugated box-making machines made to enhance shipment of milk. Raw milk storage capacity increased from 70,000 gallons to 140,000 gallons and pasteurized storage increased from 40,000 gallons to 160,000 gallons. The company’s juice, fruit drink and bottled water production was increased 20 to 30 percent. The expansion added 8,000 square feet to the milk plant for a total of 40,000 square feet. Two new 2,000-gallon buttermilk tanks were added to almost triple the company’s buttermilk capacity. Plains became able to produce water in half-liter plastic bottles, as well as in gallon and 2 1⁄2 -gallon plastic containers. Revenue for the dairy had been increasing at the rate of about 7 percent annually in the late ‘90s and Garlington expected the year’s gross revenue to exceed $40 million…. “The demand for milk and other products is growing, and we have to increase our productivity to remain competitive with other producers,” Garlington said. Again, community involvement has been on the Plains menu since the ‘30s. Plains has always been a big supporter of West Texas A&M University and other schools. 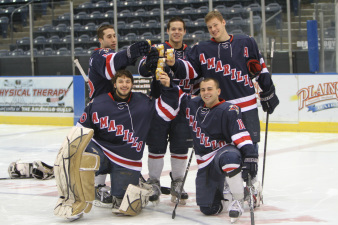 They continued into the 2000s, with a pro-dairy marketing program for student athletes. Young people were being besieged with energy drinks. WTA&M Head Strength and Conditioning Coach Sarah Ramey was looking for ways to improve methods of getting the Buffs and Lady Buffs in better physical shape. Plains recognized an opportunity to emphasize the nutritional value of milk and dairy products. It was a just the type of nourishment WTA&M needed. Coach Ramey knew that low-fat chocolate milk was one of the best natural sources of vitamins, minerals and protein to speed the recovery process after grueling workouts. According to the National Athletic Trainers’ Association, “post-exercise hydration should aim to correct any fluid loss accumulated during the practice or event,” and maintaining hydration is key for health and physical function. Rehydration beverages should include water, carbohydrates and electrolytes – a nutrition profile that closely matches low-fat milk. Many dairies were established in the region by families with dairy experience in California and other western states. A bevy of environmental regulations and urban sprawl were too much for some families with several generations of dairy in their blood. They expanded to the Panhandle area. It was to become one of the nation’s premier dairy regions. “If someone called at midnight for a quart of milk, we delivered it to them,” said Fred Weathers, 89, who worked at the plant from 1939 to 1950. “And I bet we’d do the same today, if a retailer called,” said Dub Garlington, Plains Dairy president. Frank Jones, 70, worked at the plant from 1952 to 2002, retiring to Harker Heights. He came back to Amarillo for the company’s anniversary celebration. Jones said he watched the plant go from glass bottles to paper cartons to plastic jugs, and from wooden milk cases to wire milk cases and now to corrugated boxes. House-to- house deliveries used to make up 60 percent of the business, and the delivery routes went as far north as Clayton, N.M., and Liberal, Kan., he said. There were 32 routes inside Amarillo and that many outside, Jones said. 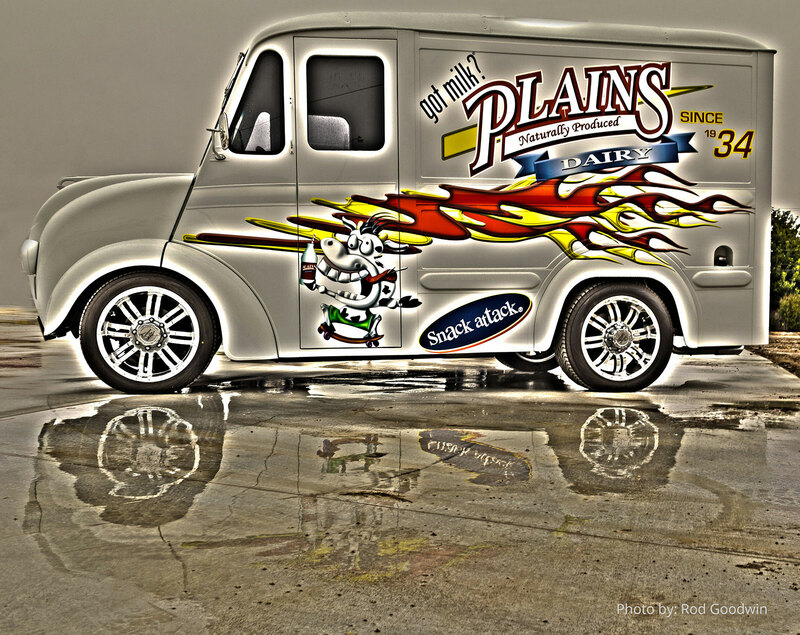 Plains Creamery was founded in 1929 by J. Lindsay Nunn and located near Tradewind Airport. In 1934, it was incorporated as Plains Dairy Creamery…. At the height of production, the now-retired workers said there were as many as seven dairy processing companies in Amarillo. One by one, they were either bought out by Plains or closed their doors, with the last competition being Borden Dairy. Borden sold to Dean Foods in 1989 and closed the doors locally. It wasn’t always easy, Weathers said. During the war, everyone had to do a little of everything. The 10 to 12 employees worked seven days a week and they couldn’t get enough help, he said. “There were quite a few dairy farmers and they’d bring their milk in 10- gallon cans and we’d put it in the vats after we tasted it,” Weathers said. He said they pasteurized the milk to 4.2 percent cream, compared to the current 2 percent. The milk was bottled into 5-gallon cans for restaurants, gallon jugs, pint bottles, half-pint bottles and gills, which were the perfect size for restaurants to serve to their customers ordering cereal, he said. Bill Neal, 89, who worked there off and on from 1943 to 1973, said it was a small place when he started, taking in about 500 gallons a day. His job was to bottle all the gallon jugs by hand. Moving into the new plant was a big change. The milk started going into paper cartons and everything was bigger. By that time the work force had grown to 21 people in the plant with additional route drivers. Neal said his route was to Panhandle and Claude, and he delivered to schools, grocery stores and homes. Before he left, the plant was processing 5,000 gallons and workers still went seven days a week. He said one time he worked three months without a day off. 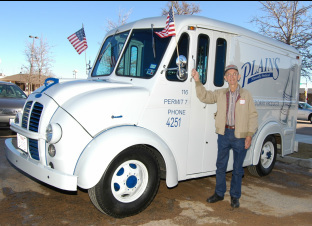 Plains held a 75th anniversary party in 2009. Many former employees and city, county and state officials joined the celebration. Amarillo Mayor Debra McCartt led everyone in a toast. That was about the time further expansion plans were in the works. The dairy completed a major $10 million expansion in April 2014. That was a few months after Greg Meador replaced a retiring Dub Garlington as Plains president. The expansion added new buildings, cold storage silos and technology upgrades to keep up with current stringent federal regulations. The expansion coincided with Plains Dairy’s 80th anniversary and it was capped off by a special toast – with “Milk and Cookies,” of course! Plains is now part of the Lone Star Dairy Group cooperative. It also supports Milk PEP (Processor Education Program) and the familiar “Got Milk?” campaign. Got Milk capitalizes on the high degree of vitamins and minerals delivered in a single glass of milk. The Got Milk “milk mustache” is about as recognizable as any food group logo in the nation. “We at Plains are extremely proud of our long history and how far we’ve come since J. Lindsay Nunn took a chance and established this dairy more than 80 years ago,” Meador said. “Mr. Nunn saw a great future for Amarillo and the surrounding area. So did A.F. Madison, L.B. Parker, Dub Garlington and leaders with Affiliated Foods. 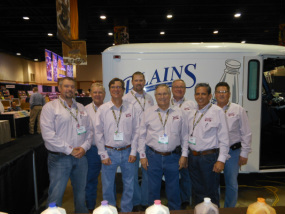 And with our association with Affiliated Foods, Plains Dairy is part of one of the nation’s most respected food distribution networks that serves cities and towns in seven states.